Indoor rowing [with correct form] is one of the most bang-for-your-buck workouts you can get. Why? Most of the movement is powered — belive it or not — by your legs which are the powerhouse muscles of the body. Not to mention your arms and core get a great workout as well. When fellow fitness instructor Meredith Walter tipped me off that Baltimore was getting it's own indoor rowing studio - I made plans right away to check it out. Harford ROWhouse is a high-end studio experience in a small town suburb of Baltimore. While indoor rowing is insanely effective — alone it can also be super boring. Put a bunch of rowers together, create a choreographed workout that combines power intervals with upper body moves and put it to a bangin' playlist - and now you're talking more my language. A single drop in class is $17 - which is basically a steal considering you can't get a drop in at the trendy NYC City Row for under $30. You won't find any class packs though — other than drop in all classes are by membership only. You can can choose from Gold, Silver, or Bronze membership - which will run you $180 (3 classes a week) / $120 (2 classes a week) / $60 (1 class a week) respectively. The studio - formerly home to StudioFitness pilates - is tucked away in scenic Fallston MD. You won't find flashy anything here - and that's the way owner Trissane likes it. What you will find is a SOLID workout with some of the most down to earth people. It's encouraging, supportive, and best of all fun. It's like working out with friends. The studio houses eleven top of the line WaterRowers which use a chamber filled with water to create dynamic resistance with every stroke. Not to mention much smoother and quieter than it's more traditional counter part. 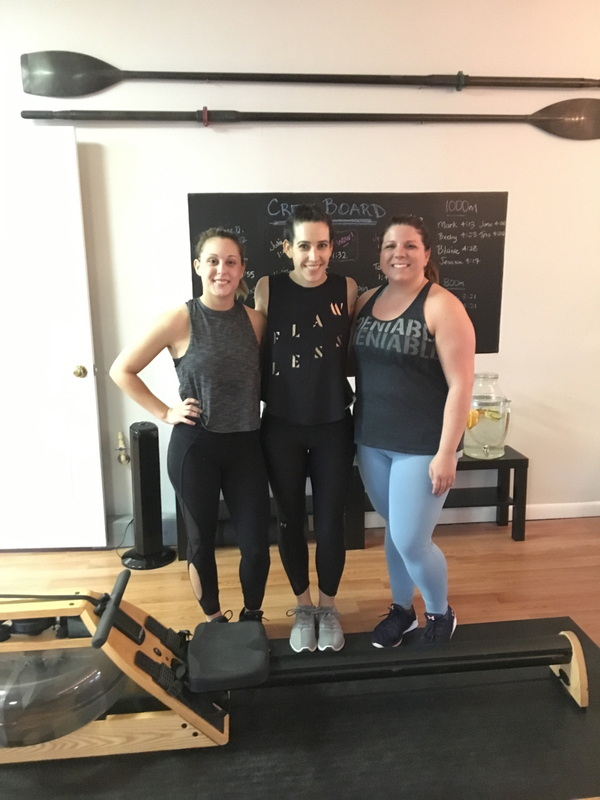 harford ROWHOUSE offers a few different types of classes - some mixing in more off the rower moves than others - but all incorporating traditional rowing elements such as easy row and power intervals. Now if you're reading this thinking "I have never been on a rower in my whole life I have no idea what I'm doing" don't worry! Although I had been on a rower a few times I was FAR from an expert. Trissane made sure we were all set up correctly and gave great pointers throughout class to make sure out form was on point. The room is set up so she has a perfect view of everyone — and it's not too large that you'll get lost int he back. The format is very similar to spin in that you'll do an easy warm up, going through each of the different moves. Easy row, upper body moves, bicep curls, mixed with power intervals where your goal is to push off as hard as you can against the resistance. You'll also get off the seat and do some fun moves like sliding lunges with your foot on the seat, or plank with your hands on the seat and slide into a pike position. Trisanne's extensive background as a pilates teacher means she has a great eye for form as well as some creative moves up her sleeve. You can't go wrong with a workout that gets you sweaty and is not the typical intimidating gym or studio. Be sure to check out harford ROWHOUSE on facebook — not only for their regular class schedule but for their special events as well. Crew & Brew? Sign me up! Have you ever tried an indoor rowing gym or a water rower? Have you ever used a peice of equipment in a crazy way that it wasn't intended for?